With my trip to Germany fast approaching, I’m starting to look forward to doing some big paintings again. For the last few months I’ve mainly been working on smaller pieces and although this has been very enjoyable I could do with stretching my arms again. This painting was done back in 2007 as a commission for a client. It was certainly the largest painting I’d tackled and it gave me the opportunity to see if the ‘acrylic & pastel would work on a larger scale. The painting was to be hung on a large stairwell wall and so needed to work from both close up and further away, from below and from above too. The biggest problem I had with it was the composition and this changed as the painting progressed. The final piece was fairly close to my original ideas but the final composition was adjusted right up to the very end …making big changes to a painting in this stage was kind of scary! On a practical level I had to use step ladders to paint the whole of the upper section of the painting. I had the board attached to the wall with its base about 50 cm off the ground – this making the top of the painting well above my head and I was grateful for the high ceilings in my studio. It took a bit of time to adjust to painting from step ladders and I did worry that I’d forget I was up there and step back for a quick look …but thankfully there were no such incidents. The only real problem with the step ladders …was climbing them with stiff legs after a long day out on the hill….I tended to work on the lower half of the painting for a couple of days when this happened! The painting itself is based on a December day when I’d been out walking with our local mountaineering club Air na Creagan. 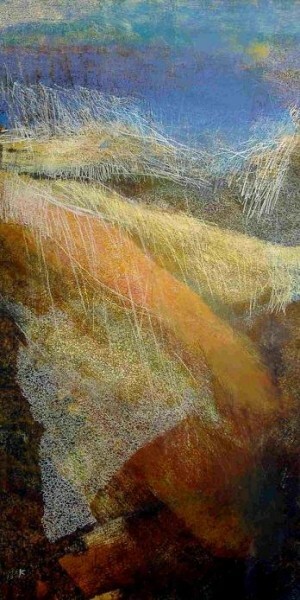 The late afternoon sun on the wild hills created wonderful colours and textures and seemed perfect for a painting.